Wow! Are we blessed in march? Five Midnite shows in a row, Miners Foundry on wednesday the 20th, The Independent on the 21st, Crystal Bay Casino in Lake Tahoe on friday, 19 Broadway on saturday, and Moe's Alley in Santa Cruz on sunday. I'm going to all but lake tahoe....seems like a haul. Hey Nomo! I am trying to go to all the shows you mentioned but the Santa Cruz one. I have to see if I can come up with the funds. I was set to go no problem but need a new water pump in my 4runner. Hoping I can make Grass Valley, San Fran, Tahoe and Fairfax before heading back to Oregon on Sunday. If not atleast I have tickets for Provolt, OR Portland and Seattle in April! Thanks for the vid aquaponics! Just watched that last night on FB. i was at that DC show. haven't caught midnite in a long time as they rarely venture to DC anymore. my take....there were moments of greatness accompanied by long stretches of monotony. since i caught them last (maybe at snwmf 2004), its only gotten alot more "tired" if you would. Ron Benjamin moved over to bass (a while ago i guess) and the new keyboard player did not play one line all night, even in songs like "mama africa" where the keyboard line is so critical to the identity of the song (if you skip to minute 25 of this video you see can see what i mean). all he did was strictly chank for 2 hours. and the guitarist added only the occasional riff into his chank. on top of that, they would play the same song forever. so, by the end of each song, the crowd is completely zoned out, and I was dying to hear something different. maybe some people are looking for that deep meditation (and I'm looking for that on occasion, but not at a club with some friends on a friday night), and i respect midnite for not compromising their style. but for me, they leave alot to be desired. also, different. Ron Benjamin used to start all the songs with his keyboard chank, and the rest of the musicians would drop in. Now, Ron starts the songs on bass and others drop in and its not as good. imho. Edited 1 time(s). Last edit at 02/11/2013 08:36PM by treez. Everyone is entitled to there own opinion. I think that Midnite is the best band I have ever seen live and will support them for life! I seem to be the minority, I prefer Ron starting the song off on the bass. I love Ron on the bass and Ras L on the keyboard. Wish they were swinging through Sonoma County....bumma. Hey jcom, I was born in Healdsburg and grew up in Santa Rosa, Lived in Petaluma for a bit. Live in Bend, OR now. How is Sonoma County? You should catch them in San Francisco or Fairfax. Well worth the drive. Nice Randomguy2me, you seeing them in COSTA RICA? That will be an epic show! Always wanted to go to Costa Rica. 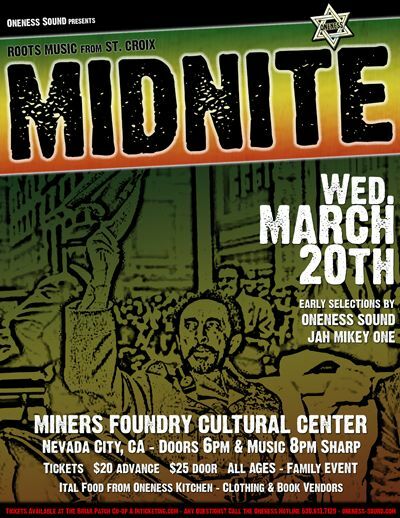 Midnite and Jah Mikey One Sounds on the spring equinox....that's Balance! No Rosta, I did not see them in Costa Rica. I was just putting it out there for people who wanted to see Midnite and people who wanted to go to Costa Rica because there was a thread earlier about it.